CellularChief | Believe in the Chief, He would never lie to you! He writes about cellular devices and other electronic things. Samsung’s fourth-generation Galaxy Note is my daily driver. Here are some tips and tricks I have learned along the way. It comes with a 5.7-inch Super AMOLED display, a sleek metal trim, and a dockable S-Pen… and that’s just on the surface. It’s also chock full software features you can enable with just a few simple taps and a little bit of free time. In fact, there may be too many software features—it can be a bit overwhelming for new users. 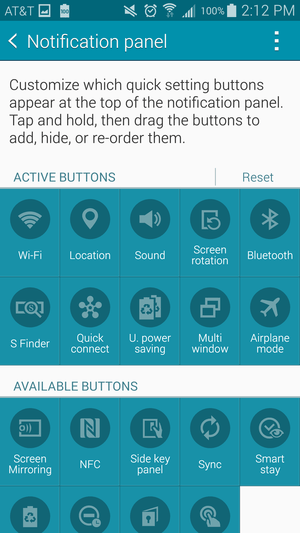 Here’s just a small helping of some of those features, and how to use them to get started with your Galaxy Note 4. Need to pen a quick grocery list for later? Don’t waste ink and paper when you can use the Note 4’s integrated S-Pen to make a virtual sticky note and pin it to your Home screen. You can pin multiple stickies to your Home screen to refer to again later. To do this: pop out the S-Pen, hover it over the display, then click the button and select Action memo. Write our your list, then tap and hold the pin icon in the upper right-hand corner. 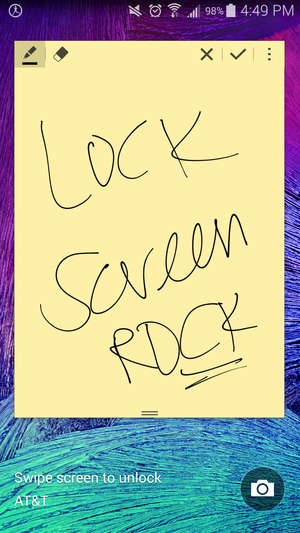 Your Action memo will turn into a tiny little sticky note that you can place anywhere on your Home screen. When you don’t need it anymore, just remove it like you would any other icon or widget. Pop-up view is great for multitasking. It acts kind of like the desktop windows you’re already accustomed to on your Mac and PC. To enable it, go into the Settings, tap on Multi window, and then tick the box next to the Pop-up view shortcut option. Now you can use the feature by swiping down from the top left or right corners. You’ll know it’s working when you can drag to resize each individual window. Pop-up view turns individual apps into their own windows that you can move around the Home screen. You can tap with your finger or hover the S-Pen at the top of the window to bring up the menu bar with options to move the window around the Home screen, shrink and expand it, or exit out of it entirely. Bear in mind that not all third-party apps support this functionality—only those that have it enabled through the Samsung-provided API. Sometimes, you just want to share what you’re looking at with the world. You can do so on the Note 4 with an S-Pen feature called Image Clip. Where would you share this heart-shaped cut out? Pop out the S-Pen and hover it over the screen, then click the button and select Image Clip. 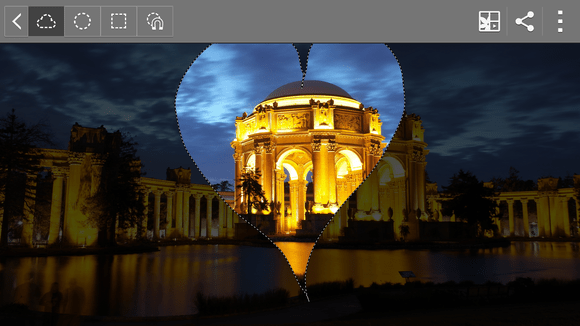 Use any of the provided crop shape tools to select a part of the image or part of the screen you want to share with friends and family. Hover up to the right-hand corner and tap the Share button; from here, you can send the clip off to apps like Instagram, Facebook, Twitter, or whatever messaging app you have as your default. Turn Flipboard briefing off—or on! I’m personally glad that Samsung nixed the My Magazine app and just stuck with Flipboard—that’s all it really was in the first place, anyway. I’ve decided to leave Flipboard on as part of my Home screen. Out of the box, Flipboard Briefing is turned on by default and lives to the very left of your Home screen on the Note 4. You can leave it as is, sign in to customize the content to your liking, or turn it off entirely from the Settings panel (find it in the Home screen settings). Samsung included a nifty one-handed operation mode for those in a bind—specifically those stuck in a crowded train car, clinging on for dear life on a shaky commute home. Simplify your time with the Note 4 by enabling one—or all—of its three different one-handed operation modes. 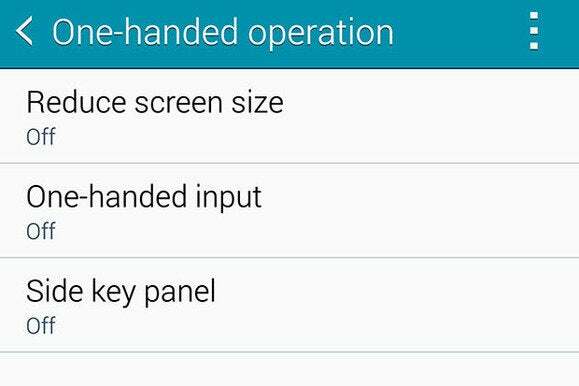 Under Settings > One-handed operation, you can choose from three different one-handed utilities. They’re all pretty self explanatory: Reduce screen size lets you adjust the screen size and layout by swiping out from the midpoint or either edge of an app; One-handed input shrinks down apps like the Dialer, in-call buttons, and Samsung keyboard so you don’t have to pull a thumb to reach the “A” key, for instance; and Side key panel will pop up Android’s navigation buttons on screen so that you have access to them no matter the orientation. The Galaxy Note 4 has a built-in Blocking mode that lets you shut out people when you don’t want to deal with them, while still allowing calls and text messages to come through in case of an emergency. You have the right to not be disturbed! 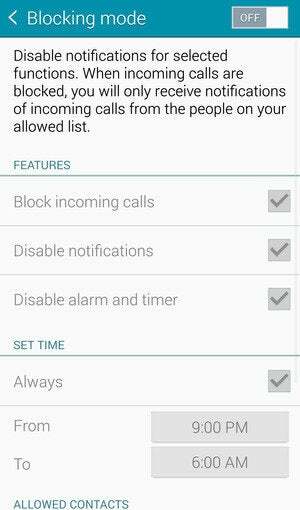 In the Settings menu, under Blocking mode, you can choose when to block incoming calls, disable notifications, and disable the alarm and timer. You can also choose to have your phone always block calls, which is especially useful in the case of a family vacation, for instance, when you only want calls from your group to take priority. Towards the bottom of the Blocking mode settings, you can edit whose calls can come through by individual contact entries or contact groups. You can customize the Quick settings directly from the Settings panel, or drag the panel down from the top, tap the Quick settings icon, and then tap the pencil icon to start editing. This is an awesome feature if you love to use the S-Pen and take notes, but find the task of unlocking your phone to do so takes too many steps. Got an idea? Write it out without unlocking your phone. You can enable the feature from the Lock screen panel in Settings, then tap to enable Action memo on the lock screen—if it’s not already selected. From here on out, you can hold down the S-Pen button and double-tap the Lock screen to bring up a blank Action memo sticky. Bear in mind that you can’t pin these memos to the Home screen, but they will save to your Scrapbook. Samsung bundles all those numerous S-Note templates with its Note devices for a reason—so you’ll use ‘em! You can find them in the S-Note app by tapping the Settings button in the upper right-hand corner and selection Use new template. It’s never too late to try new things—like one of S-Note’s templates. S-Note lets you use add any of the template pages to an existing “notebook” to make it easy to organize as you see fit. There are also templates for planning out your day, writing out a virtual “handwritten” Thank You note, and even Landscape-oriented templates for penning longer pieces (or if your writing is kind of sloppy, like mine). There are also templates you can download to make charts and sketch out an idea, and background images to make a fancy digital note for a friend. Use your volume keys to record memories! Tap anywhere on the screen inside the camera app—just not on the shutter button—and then tap the Settings icon. Tap again for more settings. Tap on The Volume Key towards the bottom of the screen; from here, you can set what the volume keys do, whether it’s to snap a photo, record a video, or act as the zoom controller. 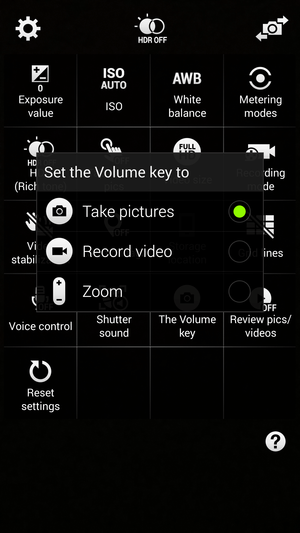 In that same settings menu, you can turn on voice control to take photos or record video. “God, why is she calling me again?” PALM ON PHONE. DONE. Sometimes you can’t stand certain people; their personalities, their lifestyles, but you keep them in your life because…well that’s for you to discuss with your therapist. If you just simply can’t handle talking to that person on the phone, the Galaxy Note 4 has this neat feature that lets you place your palm on the screen or flip the device over to silence an incoming call. From there, you can just let it go to voicemail. The person on the other end will assume you’re busy, rather than intentionally ignoring them, which is a wonderful, passive aggressive way to carry on a relationship. Seriously, why haven’t you done this yet? Go back to that Settings panel I keep referring to, tap on General, then tap on Power saving. You’ll see options for Power saving and Ultra power saving mode. How will you unlease the Power (saving modes)? Power saving mode works in the background on the Note 4 while you go about your daily business. You can select whether to restrict background data, restrict overall performance—which dials down the processor, brightness of the screen, and the touch key lights—and it even turns on a specialized “Grayscale” mode that seriously turns your phone into a 1920s era black-and-white silent film. 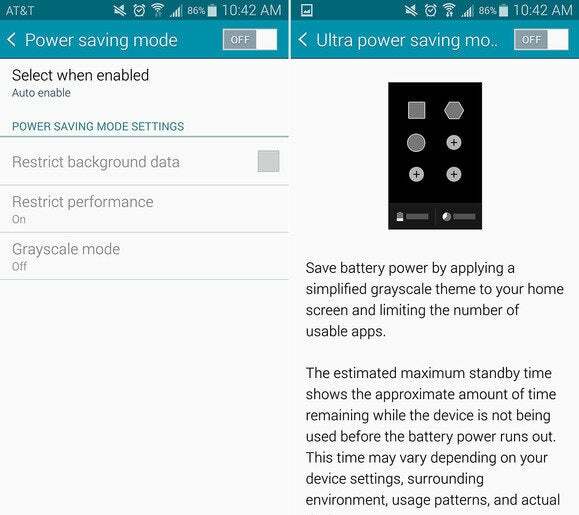 Now, if you plan to be out in the wilderness or somewhere without electricity, but still want access to all that data on your phone, you can enable Ultrapower saving mode. It will not only convert your phone to the aforementioned grayscale color palette, but also only offer access to only six basic functions, three of which are available by default: Phone, Messages, and Internet. At the bottom of the screen you’ll see a gauge of how much battery life you have left and how many days the device can last on standby. When you’re no longer in need of battery saving abilities, or just simply want to step back into a more colorful world, tap the Settings icon at the top and turn off Ultra power saving mode. Thus far, this only seems to work with Samsung’s default messages app. If you forgot your glasses at home for the day, you can easily increase the font size on your text messages by hitting up on the volume rocker. Unless you really feel like you want a shortcut to S Voice, you can shut it off in the Settings panel. Under Settings > Applications > S Voice, tick the box next to Open via the home key so that it’s no longer selected. S Voice is personal digital assistant non grata. Now, nothing will happen when you double-press the Home key, leaving you only with the help of Google Now. It’s like wax on, wax off, but with the display. This is pretty neat. Under Settings > Accessibility > Dexterity and interaction, tapAir wake up. This will let you hover your palm up and down over the screen to turn it on. Like magic! Hiding some something? Or perhaps you’re hiding from someone? 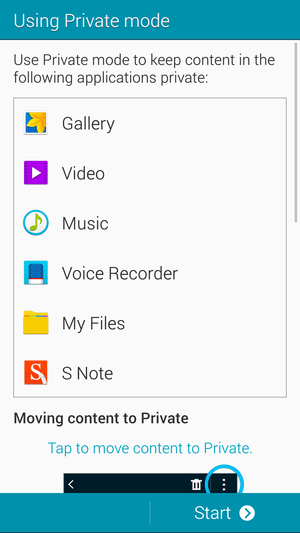 While I’m not suggesting that you lie to anyone (lying is super bad), but I do suggest you turn on Private mode, especially if you plan to use the Galaxy Note 4 for work-related matters. Private mode can be enabled through the Settings menu; once you get started, it’ll walk you through the whole process to keep content like your apps, music, files, and video sequestered from the rest of your super serious work stuff. Easily turn on the Touch sensitivity setting from the Quick Settings toolbar. It’s going to be winter soon and you’re probably going to be sporting gloves until next April. It’s hard to use a phone with gloves on. Fortunately, you can increase the Note 4 display’s touch sensitivity from the Settings menu, so you don’t have to take those gloves off just to send a text message, and you won’t have to look forward to frost-bitten fingers anytime soon. A new report from PhoneArena claims the Galaxy Note 5 will feature an Ultra HD display with a resolution of 2160 x 3840 pixels. Specifically, the Galaxy Note 5 may pack a 5.89-inch UHD screen, giving it an insanely high 748 pixels per inch (ppi). Meanwhile, the rumored Galaxy Note 5 Edge will allegedly feature a slightly smaller 5.78-inch display. That means it could pack in 762 pixels per inch. Based on these rumors, the Galaxy Note 5 and its Edge variant will boast the highest resolution smartphone displays we’ve ever seen. We’re still not totally convinced any of this will actually happen though, and it’s unclear what practical advantages UHD might have over today’s Quad HD displays. More pixels may sound nice, but it could mean less battery life or a more expensive handset. Stay tunes for more rumors and updates! Verizon Wireless recently filed paperwork with the Federal Communications Commission seeking permission to buy the assets of Golden State Cellular in California and Mobi PCS in Hawaii. Verizon confirmed with Fierce Wireless its plans to acquire Golden State Cellular’s spectrum, network assets, and customers in several markets in California, including Amador, Alpine, Calaveras, Tuolumne, and Mariposa counties. Verizon will transition Golden State Cellular’s 18,000 subscribers to its network within 15 months of the deal’s closing. In Hawaii, Verizon will acquire 20-30MHz of PCS spectrum from Mobi PCS, and then lease back 10MHz of that spectrum so Mobi can transition away from being a stand-alone service provider. Verizon said Mobi is still exploring several different ways to exit its wireless business. Both proposal are subject to FCC and other government regulatory approval. Verizon and competitor AT&T have spent the last 12 to 18 months acquiring a significant number of small, regional network operators mostly for their spectrum assets. Beginning today, consumers can bring any aging Apple product to an Apple Store for free recycling. The company explained its renewed commitment to sustainability in a post on its web site, which also includes other initiatives. Before today, Apple required users to fill out an online form before accepting old gear for recycling, and only accepted certain devices. The new program covers Apple smartphones, tablets, laptops, desktops, and accessories. Apple will provide customers with Apple Store gift cards for select products (iPhones and iPads) that are in good, working condition. Apple said it will also accept products from other companies during special, pre-announced recycling events. In addition to the recycling program, Apple said it is looking to make devices more power efficient, make devices free of toxic materials, as well as power its plants and facilities with renewable energy sources. T-Mobile and MetroPCS today announced the availability of the LG L90 and L70, devices that fall into LG’s L Series III lineup. Both phones were revealed by LG earlier this year. The L90 and L70 run Android 4.4 KitKat with LG’s user interface enhancements. The hardware puts LG’s minimalistic design esthetic to use. Shared features include support for Bluetooth, GPS, and Wi-Fi. L90:The L90 is being sold by T-Mobile and supports the carrier’s LTE 4G network. It has a 4.7-inch qHD display, quad-core 1.2GHz processor with 1GB of RAM, 8GB of internal storage, 2,540mAh battery, and an 8-megapixel/1.3-megapixel camera configuration. It will be available beginning April 30 for $0 down with 24 equal monthly device payments of $9.50, or the full retail price of $228. Sprint’s variant of the LG G2 should begin receiving the Android 4.4 KitKat update beginning today. In addition to KitKat, the update adds cloud printing. The system update is being distributed in waves and may take several days to reach all users.